ow, ow, ow, ow, ow. See? I just wrote that. Just now. Super easy. 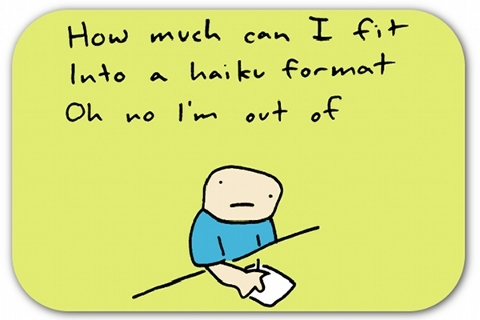 I’d like everyone to give it a shot just to see what a fun creative outlet haiku can be. I keep asking my coworkers (and Dad) for them when they’re bored in meetings (and my coworkers definitely are), but to no avail. I’ve taken to writing haiku about my classmates and sharing it in the classroom group chat. My professor really enjoys it, so whenever there’s a technical issue or a delay of some kind, the professor (and sometimes my fellow students) will ask for a haiku about it to keep us entertained. I keep it light at try to be funny. It passes the time, and I like to see the smile on people’s faces after they read my little poems.